Home » Aesthetic News » Liposuction » How Long Does a Liposuction Procedure Take? Liposuction is a minimally invasive cosmetic procedure used to remove stubborn fat that you can’t get rid of through diet and exercise. Most bodies develop adipose tissue, or fatty deposits, over time. These deposits can be tough to shrink, even with diet and exercise. Liposuction involves inserting small tubes called cannula through small micro incisions to suction out these fatty deposits, leaving patients with improved body contours and overall proportions. 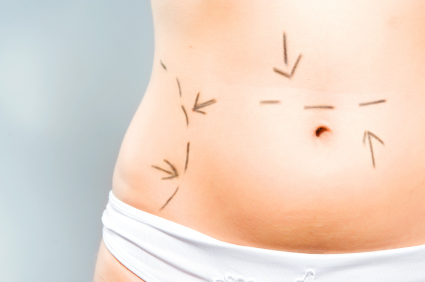 A dermatologic or plastic surgeon performs liposuction on target treatment areas such as hips, belly, back, arms, thighs, buttock, and face, and often in conjunction with other plastic surgery procedures like breast reductions, facelifts, and tummy tucks. The average liposuction procedure takes 2 to 3 hours. However, the time can increase or decrease depending on the patient’s size, areas being treated, and the number of treatment areas. The treatment time can also vary based on the type of anesthesia being used, as it takes longer to inject local anesthesia as opposed to administering general anesthesia. Though the procedure itself takes from 2 to 3 hours, patients can expect to be at the surgery facility or doctor’s office from 3 to 7 hours. This includes time to prepare for the procedure, and to come out of anesthesia. The majority of liposuction treatments are performed as outpatient procedures, meaning the patient goes home the same day as the surgery. Patients can expect side effects including swelling, bruising, and mild discomfort, but usually return to normal activates after two weeks. Patients are also usually expected to wear a compression garment for two to three weeks after the procedure to help promote healing and reduce swelling. The doctor may also prescribe pain medication to help alleviate soreness after liposuction. Since the average liposuction incision is only two centimeters, they heal quickly with minimal scars that are easily hidden. Fat cells are permanently removed during liposuction, and therefore can’t grow in size. However, patients can regain weight with the development of new fat cells, usually in different areas of the body. Therefore, patients are encouraged to follow a healthy diet and exercise plan to keep their new shape and reduce new fat call growth. It’s important to remember that every patient is different, and therefore requires a personalized liposuction plan and set of expectations. The best way to determine if you’re a good candidate for liposuction, and what your specific course of treatment should be, is to talk with an experienced plastic surgeon. Dr. Thomas Loeb is renowned for his amazing liposuction NYC results, and can work with you to develop the best treatments to get you the body you want. Call today to schedule a one-on-one consultation!